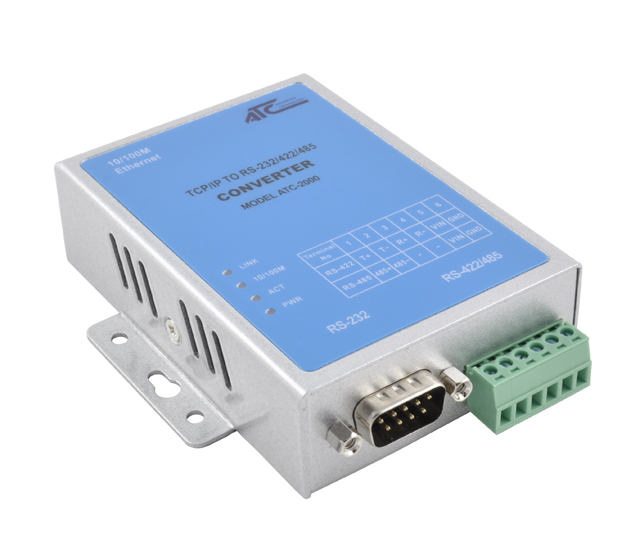 The ATC-2000 is a RS232/RS485 to TCP/IP converter integrated with robust system and network management features designed for industrial equipment to be accessed and controlled via Intranet or Internet. By integrating RTOS (Real Time Operating System) and complete TCP/IP protocol stack capability, ATC’s ATC-2000 provides not only a robust and high performance system to make your device connecting to Network, but also ease installation and Internet access. The ATC-2000 Web Configurator is a breeze to operate and totally independent of the operating system platform you use. RS-232/422/485 3-in-1 serial interface 300-230.4KBPS baud rate. RS-485 conversion offers automatic data control. Support 2 wire RS-485, 4 wire RS-422. Virtual serial port driver for Windows OS. All serial ports have built in 600W lightning protection. 10/100M Ethernet, auto detect straight/cross cable. Support protocols like TCP/IP, UDP, DHCP , PPPoE, Dynamic DNS. Support standard DIN-rail, easy to install and fix. SCADA, measuring instruments and monitoring system. Check on work attendance/ Human resource management. 256 KB ROM and 768KB SDRAM. 10/100Base-T, half/full duplex. Obsugiwane protokoy komunikacyjne:TCP, IP, UDP, Telnet, ARP, DHCP, ICMP, Poppe, http, DDNS, SMTP. RS-232 (TxD, RxD, RTS, CTS, DTR, DSR, DCD, GND). 1200 bps ~ 230.4 Kbps. Linux (dla pracy w trybie Client/Serwer TCP/UDP). Wbudowany serwer http - konfigurowanie i kontrola pracy konwertera z przegldarki internetowej (IE 5.0 lub nowszy). Dostp zabezpieczony przez nazw uytkownika i haso. Funkcja tzw. backup-u parametrw konfiguracyjnych do celw kopii zapasowej lub powielenia na inne konwertery. 7.5~ 30 Vdc. Maksymalna pobierana moc 3W. Temperatura skadowania: -20 ~ 85°C. Wilgotność: 5 ~ 95%RH (bez kondensacji). CE (EN55022:1998Class A, EN 61000-3-2:2000,EN 61000-3-3:1995,EN55024:1998).